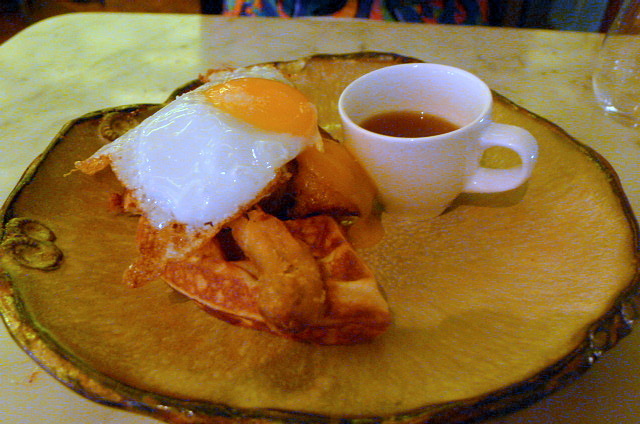 Duck & Waffle opened in the summer of 2012 and it has made an indelible mark on the London dining scene. With a name like Duck & Waffle, how could it not? But the name is not its only draw card. Located on the 40th floor of the Heron Tower near Liverpool Street, it offers glorious views over the City of London, the kind that could perhaps only be matched with vouchers for an exciting helicopter ride. Before you hit enter the restaurant proper, there is the funky stylish bar that serves a range of cocktails. It’s very cool – every bit as cool as special drinks at the Ice Bar. The restaurant itself is casually slick with an urban feel to it. 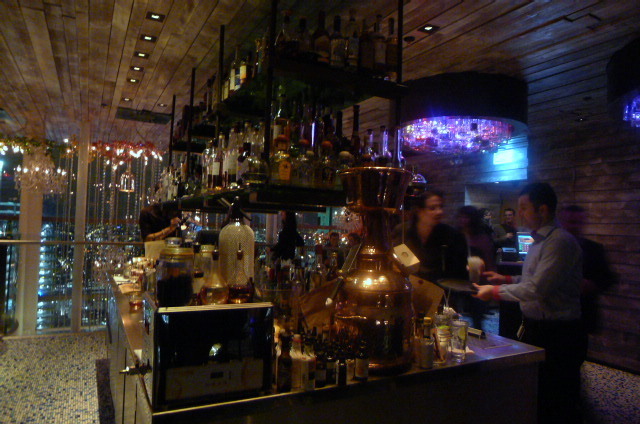 The essence of Duck & Waffle is British dining tapas style. The menu contains a selection of starter plates, breads, raw dishes, and small and large plates, some of which are particularly interesting including the unusually styled duck & waffle dish (but more on that later). 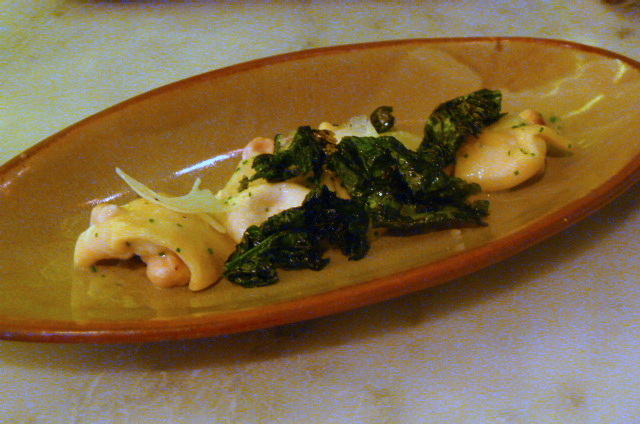 From the small plates we started with Jerusalem artichoke tortellini (£13) with wilted turnip tops, hazelnuts and aged pecorino that wasn’t entirely successful. The filling, a combination of Jerusalem artichoke and ricotta was creamy and pleasant, but was let down by the pasta itself which was far too thick and overcooked. The result was pasta that was doughy and gooey. There were nice touches though – the pecorino with its buttery and nutty overtones, and the hazelnuts with its crunchiness. But on the whole, this was a dish you could easily choose to miss, especially as it was a little cold when it came out from the kitchen. 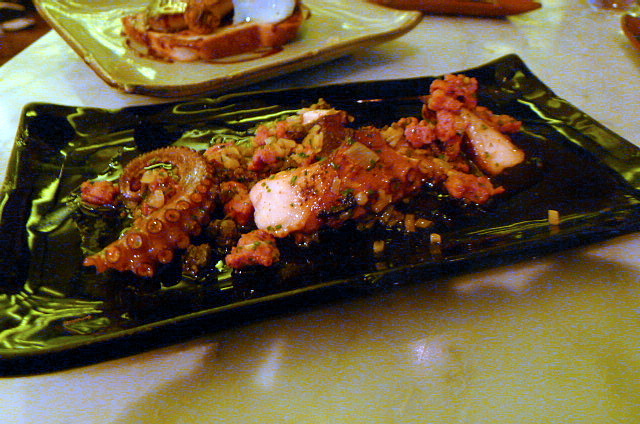 The chorizo in a dish of roasted octopus (£11) with lemon and capers boasted some great meaty flavours, but the octopus itself was bland, albeit very tender. The dish was also far too oily. The dish looked good, but the flavours didn’t quite live up to the presentation or the intention of the dish. But the food got much better hereafter as the pollock ‘meatballs’ (£9) with lobster cream and parmesan proved to be a knockout. I love the slightly springy texture of a good fish ball, and these did not disappoint. But what stole my heart was the lobster cream, which with its rich, deep, bisque-like sweetness, was truly outstanding. 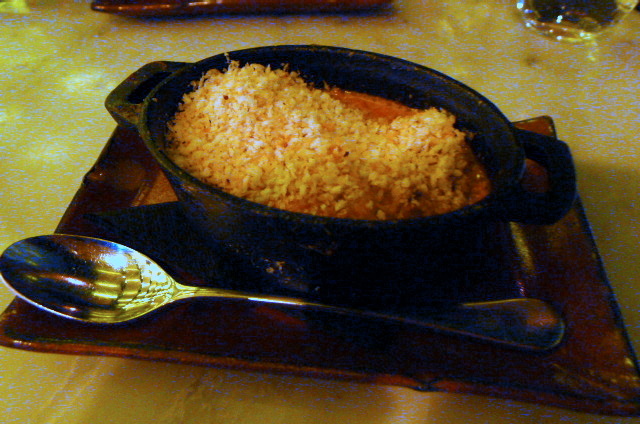 And the hints of parmesan – well this did a magic number on rounding out this wonderful dish. A foie gras ‘all day breakfast’ (£13) was a dish with two slivers of perfectly cooked foie gras perched on top of some toasted brioche spread with nutella. The foie gras was decadently wonderful and very tasty in that fat, velvety kind of way. And the melted nutella running through the buttery softness of the brioche was also very nice. But while the two components of foie gras and nutella on brioche were individually successful, I wasn’t convinced by the combination of the two. It was interesting, but not necessarily compelling. This dish also needed more acidity. The signature dish of duck & waffle (£15) encapsulates everything that the restaurant is about – slightly quirky, slightly offbeat and rather original. A decadently moist leg confit perched on top of a waffle was wonderfully crispy on the outside and tender and moist throughout. 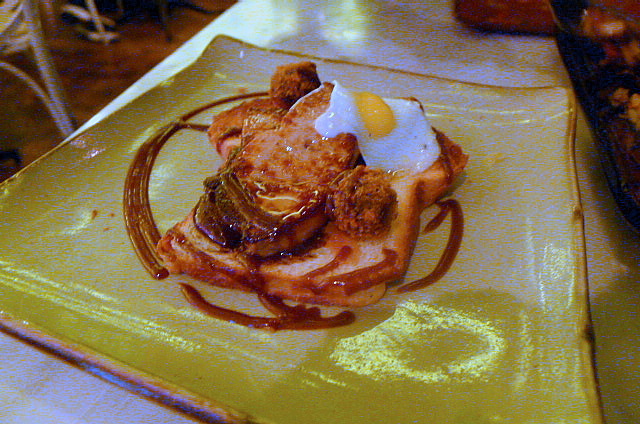 It came with a fried duck egg and a fantastic mustard maple syrup that was well balanced in its sweetness. The combination of flavours really worked, with the richness of the duck tempered by the sweetness of the syrup and the savoury dense sponginess of the waffle. This was a very rich dish that was best shared between two. 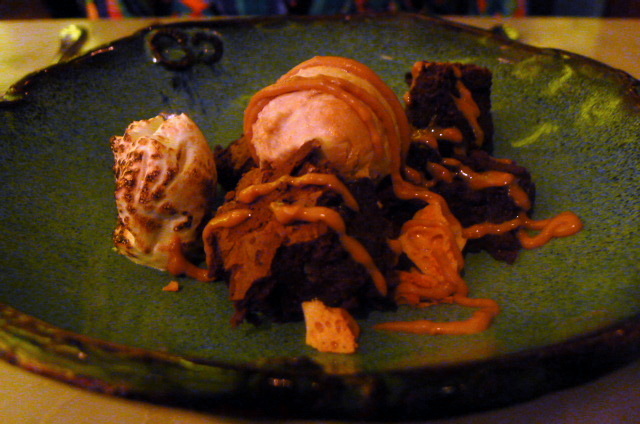 A dessert of warm chocolate brownie (£8) with peanut butter ice cream and crunchy caramel was glorious. The brownie was chocolate-y and moist without being too sweet. The peanut butter ice cream was rich and deep with a luscious peanut butter flavour, and the combination of the ice cream with the brownie went together hand in hand. The crunchy bits gave the dessert added crunch. The food comes out quick and fast, and there’s not a lot of time to breath in between dishes. In the space of 45 minutes, we had ordered, been presented with, and eaten four small plates and one large plate between two. Duck & Waffle is an efficient, well-drilled cooking machine, and it needs to be for it opens 24/7 for breakfast, brunch, lunch, dinner and late night dining. I would have liked the pace of the service to have been slower so that I would had more of an opportunity to savour the views and the and the inspired convivial and casual spirit of the restaurant. Also, for something potentially so glam, I was surprised at how relaxed the service was. To be frank, it was truly accommodating and efficient. There were some really wonderful things to be had at Duck & Waffle – the pollack fish balls, the duck & waffle dish and the brownies are not to be missed. Other dishes fared less well, but on the whole Duck & Waffle is onto a winner. Its posh comfort grub, and you can never go wrong with that. The food is rich, so go lightly on the ordering front. Price range: About £36 to £65, excluding drinks and service.